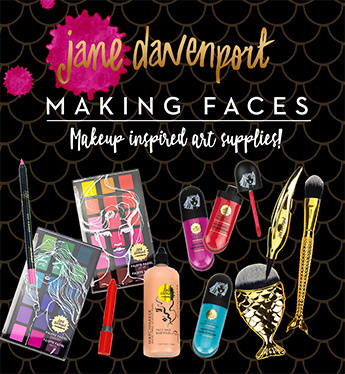 Home / The Book / Beautiful Faces Scholarship and Giveaway! 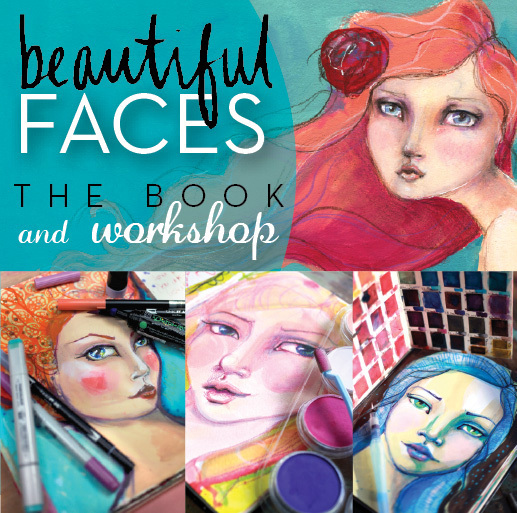 Beautiful Faces is going ‘Live’ as a workshop on June 12th. That simply means that a big group of us all join together and go through the workshop like it’s the first time! There are no set times you need to meet on-line, no regimented structure, but the group energy is certainly inspiring! 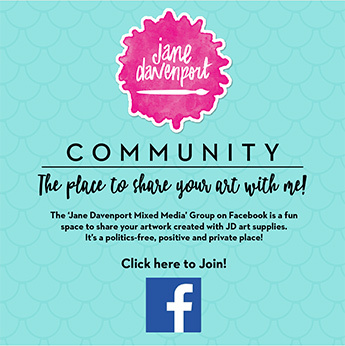 Our private Facebook group comes alive with artwork from fellow creatives all over the world. It gives extra incentive and joy! If you already a member of the workshop, you are invited to join in as well (and there’s no extra cost -Lifetime Membership privileges!). 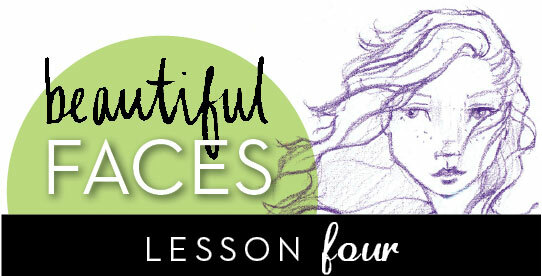 Small Faces we start small and introduce my Longitude & Latitude exercises to get the basic face turning easily! My FACE MATH™method will help you set a foundation. I also go into T’he Details’ of Eyes, the Nose and Lips. Artwork with a subject that looks like you captured them as they are on their way somewhere engages us because we don’t want to miss out on anything! how often you get your art on. your creativity into your life! 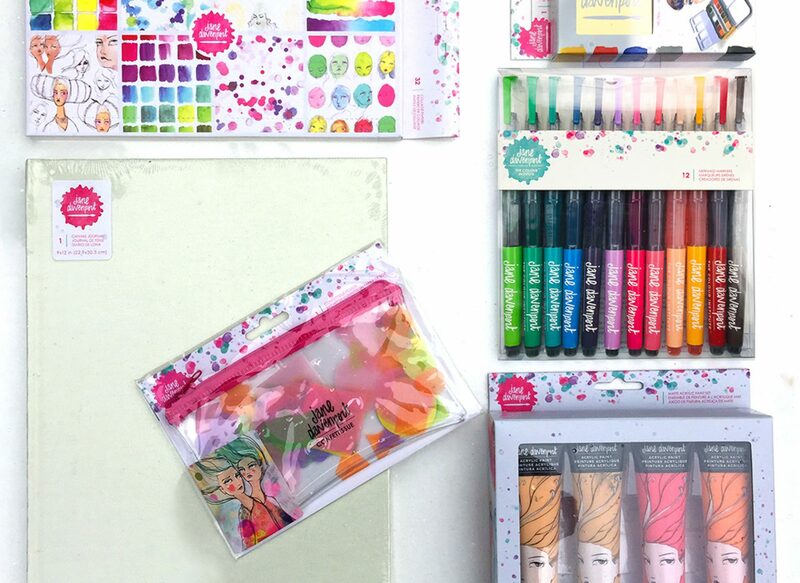 The winner will also get my ‘Next Steps’ Journaling Kit! You can see all the goodies it includes here! Tinsel the Pomeranian will be our judge. and she will have a winner for you next week! Leave your answer below and good luck! I go in spurts. Sometimes I do something regularly, a couple of times a week. But then life happens and I get away from it and find getting back is just so hard. I think about it all the time though, reading blogposts and IG posts and shopping for products. I’m trying to shorten the gap between doing art projects by leaving things out and hoping I’ll get my feet wet faster. 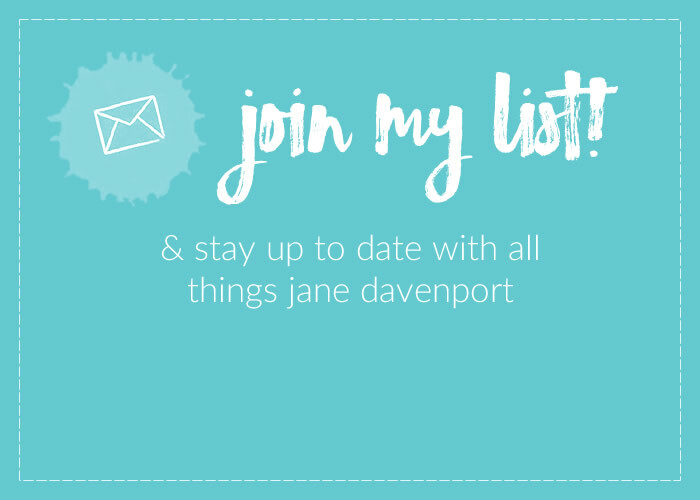 Awesome giveaway Jane. Thanks for the chance to win. My goal has been to include art in my life every day. Even if it’s only 15 minutes. Fortunately, I’ve been able to work in a lot more. It’s a matter of treating as something important that I need to do for myself. It relaxes me and energizes me at the same time. Not a very long or lyrical answer but it’s the one I’ve got. Thanks for the opportunity to win your awesome products! Art makes me happy. It makes me smile. I think about art all day. I’m always taking pictures of things I’d like to paint or draw. If I’m not drawing or painting, I’m planning the next time I can do so. Jane makes me happy because she lets me take one step at a time and enjoy the process! Hi everyone! I am a young-ish, 50-something lady with lupus. In 2014, after 7.5 hrs of surgery on my back, emergency kidney surgery, and the death of my father to lung cancer, I was pretty much at my lowest. I thought I was returning to my job (teaching) in 6-8 weeks, but told by my doctors that I could never return. I couldn’t even clean out my classroom. My husband and daughter did it. No closure for me. But then, one of my teaching friends invited me to her painting group. It truly was my salvation. It provided social time, a diversion for my much-too-full mind, and a creative outlet. I was hooked and never looked back. I started with acrylics and later began colored pencil, watercolors, etc. I began researching and found fabulous artists that were generous in their inspiration and advise. It was during this time that I found your Beautiful Faces book. Love, love your aesthetic! I would be honored to receive your scholarship. I schedule time each and every day (my art appointment) to create. With many, many specialists’ appointments, etc., I came to realize that this “therapy” is as important for my mental and physical health as any other appointment. So, I block it out on my calendar and other obligations just have to wait. 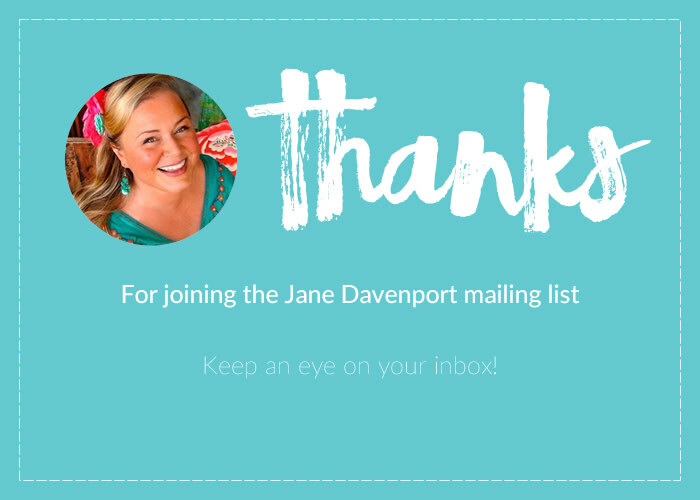 Dear Jane, just seeing your happy face brightens my day !!! I have fibromyalgia, carpal tunnel and heat activated migraines, I live in Alabama, hot summers. My passions are gardening and creating art. I love mixed media. My conditions have really curtailed my gardening, which breaks my creative heart. BUT I found you, YOU are a happy , passionate, uber talented woman, it shows in all you do. Your art is so freely beautiful and your desire to teach others how to share your joy comes straight from your heart. I bought one of your beginner classes about a year ago. Boy has your endeavor grown ! I was amazed when I went to your website yesterday. Good things happen to giving, good people. I bought your watercolor pens at Michaels the other day. Amazing product. To win this would be a dream. Because I must channel my energies toward art now. To live without creating is a death for me. My husband is a retired Iraq war veteran with PTSD. So it is vital to my well being to have a happy place to go to and our income is limited. I have done some really neat things with the few things I have, can’t imagine what I could do with this give-away. Regardless, thank you for all you have already given me. I never thought I could draw but you have taught me otherwise. It has been a life saver with my severe cut back in gardening. So happy for your continuing success !!!!!! How I make time for art- art is life, breath and soul enlightening, there is no choice but to make time. i am trying to learn to draw and paint every day. im not very art talented but i really have the desire to learn it all. i just hunger for it and lay in bed at night thinking about what i can make the next day. I have anxiety disorder so i am in the house a lot and i homeschool my little girl. art is a great way for me to deal with my anxiety by getting my feelings out on the paper. 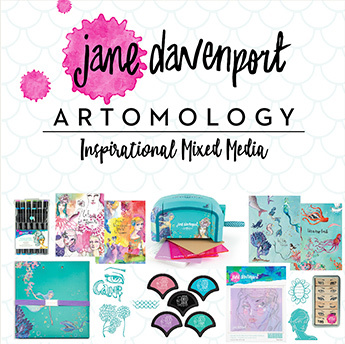 I would love to take your class! 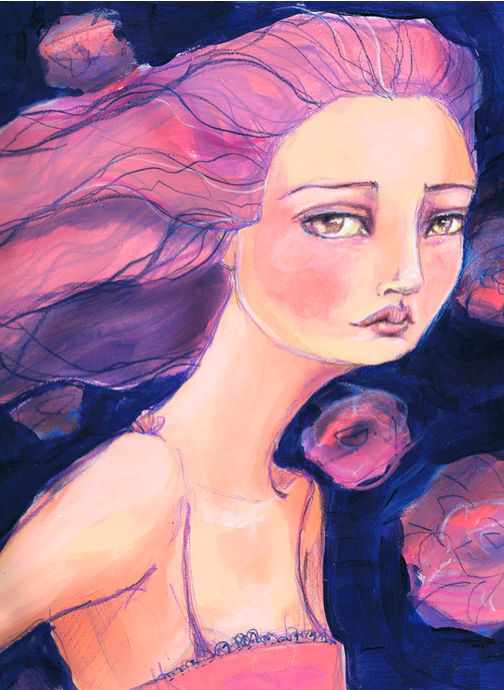 I have bought the watercolor palettes and mermaid markers so I would be interested to take it a step further. I’m an art teacher so I look for new techniques whenever I can. I create wherever I am, as much as I can, such as in China recently where I journaled our trip, did some sketching and watercolours in it, AND made a travel doll too. I get my art on as often as I can. I squeeze it in whenever I can. I had some good advice that changed my whole perspective about making the time to create art. When your art supplies are out, and you can see them and have to walk past them everyday then you are more inclined to use them. And it’s so right! Art is messy, imperfect, and since I’ve had my “messy but colurful” little art desk out, I get my art-on much more than when it’s all tucked away neatly in the cupboard. Yours was the first art book I ever purchased Jane, and it takes pride of place as it stands on my desk next to some sketches and art work I have done, as a reminder “that I can actually draw”. Thank you for sharing so much of your knowledge and passion with us all. I have an art room at my office so I play daily. 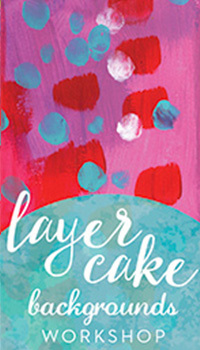 I am a therapist and I use my art as a way to decompress and reconnect to the playful part of myself. And my clients love it! My space reinforces the need for all of us to stay connected to that creative and alive child within. Congratulations on your Michaels “win” and thank you for sharing your hard work and good fortune. I try to do something creative everyday, but honestly I don’t have to try it’s more like a compulsion, ha! I have to make something, anything (except dinner, :p). It’s kinda like that scene in Close Encounters of the third kind where the guy has to keep making the mountain… yeah, mashed potato mountains, that’s me, LOL. (I would cry with joy if I won this class!!). 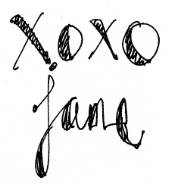 Thank you for the opportunity Jane! I’m a stay-at-home, homeschooling mama of two. I do dayhome/ before and after school care Monday to Friday and incorporate art into every aspect of my life, including ‘work hours’ with ALL of my kids. Having helped to grow their love for art and creativity inspires me to put aside time everyday to do so myself. This is exciting! I am an elementary school teacher, so art is very important to me, in and out of the classroom. I try to get my art on every evening as a form of relaxation and creativity in my art journal! I enjoy watching the davenpeeps and trying out their lessons. I love to browse the art galleries around town when I can, to get some creative inspiration and be in wonder and awe of other artists! If I get too busy with other things, my daughter happily reminds me, “Mum, you need to do your art!”. I am a 2nd grade teacher, so my art/creative time happens some in the classroom, but mostly on weekends, holidays, and SUMMER break! Thank goodness for summer break! 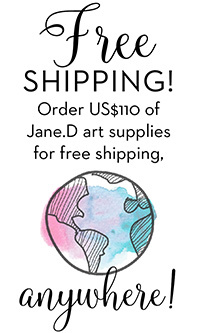 🙂 I have slowly but surely been buying up all your new yummy art supplies. They are awesome! I just received your Beautiful Faces book in the mail today! I am so excited to dive in and to see this post! Firstly I love your new supplies, secondly I live in Yakima WA and we have a very sweet young musician from Byron Bay that lives here!! Blake Noble, he is amazing. Third, I try to be creative as much as I can, I am a mom to 6 ….28,22,12,9,6, and almost 1 and am 55 years young! We are foster/adopt parents and our 3 youngest we had the privilege to adopt, last one adopted in April of this year. Anyway, money is sometimes tight but we are blessed….would love to win your giveaway! Keep smiling it’s contagious! I have art supplies (and dozens of pairs of reading glasses) skattered all over the house so when the mood strikes I can do a little sketch. Sometimes I spend time on my tablet creating little pictures, editing layers. 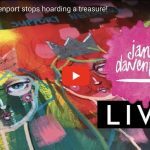 We recently went on a trip to Europe and my hubby said I had to “pair down” my luggage weight… I chose to keep my art supplies over make-up and shoes!!!! 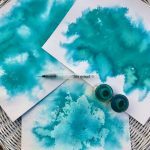 I originally started creating through cross stitch and then discovered cardmaking and now I’m art journalling and experimenting with paints and inks, and plenty of colour. It’s sometimes hard to squeeze in creative time but now I have so many cretive outlets is easier, sometimes it just enough to take a few photos of what’s around me whilst on a walk with my dog. Wow, what an opportunity. After a pretty rough few years Ive discovered that i’m actually pretty good at art. Woot woot. Would love to win this so I could continue with my daily ritual of making sure I do something creative every 24 hours. Thanks Jane for this opportunity. I’ve been a prolofic “art-onner” having completed over 200 works in 14 months. After reading BEAUTIFUL FACES & some workshops I have a new eagerness in approaching portraits. Can’t wait! Oh my gosh, I didn’t think I’d ever get to the comment box! I do my best to create every day, even if it’s only for 5 minutes. That makes it 5 minutes closer to being a better artist. It’s fun, for sure. As a single mom of three small kids who is going through a divorce, plus a full time student of geology, and a part time home care aide, life does not afford me too much in the way of creative time….but….my art studio is always there when I need a break. I strive to create every day but sometimes once or twice a week is all I get. Thankfully school is out in a week and I get to breathe again! I can’t wait to get back to my art! I love to grab at least a few moments most every day to do some quick sketches….sometimes it is the same group of trees overlooking the ocean or just a quick doodle. Other days I can actually paint with my watercolor, make cards, or do a paper craft. Love the artistic journey. I usually try to create every couple of days, and the times in between being able to play, I look for inspiration and interesting styles and works by artists that inspire Me! Thank you for your generosity with this giveaway! Oh my this would be amazing to win! !- I try to play in my art journal everyday. Mostly in short bursts, since I have a toddler at home. 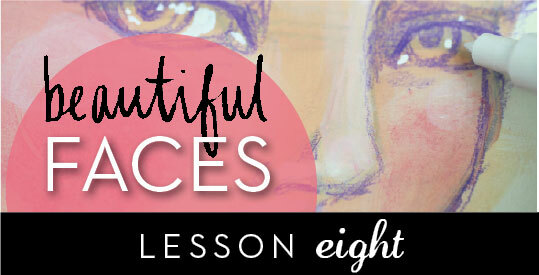 Beautiful Faces is actually on my wish list. 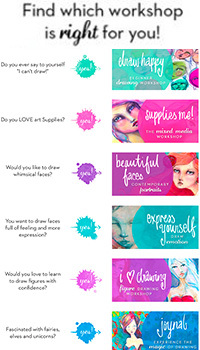 I’ve always wanted to learn how to create pretty whimsical faces, and I’ve heard that Jane’s teaching is amazing! All the extras are just bonuses for me!